The Barossa Valley in South Australia near Adelaide. What’s different about this valley? 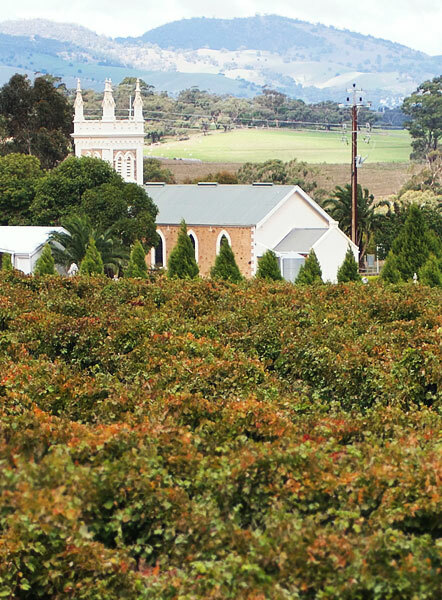 Simply that Torbreck vineyards can be found nestled, safely located in the Barossa Valley. This vineyard is something to talk about, I’ve had a few different selections and the name has always stood out, but it was only after drinking Cuvee Juveniles that I knew I’d never forget about Torbreck. Down to it’s differently distinct label, this wine is pretty unique, especially when it comes to taste. You can read up on Torbreck Vineyards as well as Cuvee Juveniles, by clicking on the two names. The abridged story goes like this, Tim Johnston opened a wine bar in Paris called Juveniles. Tim asked David to make a wine especially for the wine bar and David Powell (winemaker of Torbreck wines) did. David also ask Tim’s daughter, Carolyn, to design the label as her other paintings hung on the walls of the wine bar. Simple, yet captivating. The link to Cuvee Juveniles gives tasting notes, the break down of the grapes and all the stats. I can only agree that the wine was velvety and full, with a touch of sweet flavour from an overly ripe piece of fruit. Rounded like a nice mulled wine, Cuvee Juveniles had added spice and texture. Enjoy with game and hard cheeses. So if you’re bored of the same old Rioja and you’re looking for a new wine or a new region to be excited over, I highly suggest Torbreck Vineyards in the Barossa Valley.